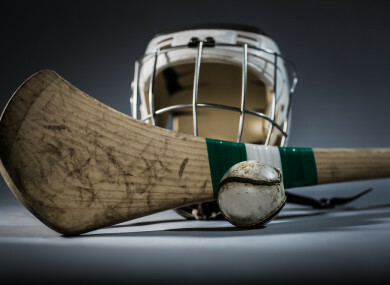 MEDICS HAVE WARNED against the dangers of hurlers modifying their helmets after one hurler sustained a horrific hand injury from a metal bar in a modified facial guard/helmet. In the February edition of the Irish Medical Journal (IMJ), medics state that the rules around hurley helmet modification will have to be enforced by coaches and referees after describing how a metal bar of a hurler’s modified helmet entered an opponent’s ring finger and exited the little finger on his left hand. The medics at the Orthopaedic Dept at the Midlands Regional Hospital in Tullamore recount while attempting to catch a sliotar, the hurler’s left hand struck the helmet of an opposing player during a club league match. The medics state that due to the modifications of the opposing player’s helmet, where the single bar removed left a sharp remnant in its place, the patient sustained a penetrating soft tissue injury to the ring and little finger of his dominant hand, becoming lodged in the nailbed of the ring finger. The medics state that the patient was received in the emergency department where the helmet was removed leaving only the metal bar. The hurler had no nerve damage to his fingers and he was transferred to theatre. The medics report that surgical exploration and removal of the metal bar entailed open exploration of possible damaged structures of the little finger. The medics state that nail-bed repair on the ring finger was performed. After routine postoperative elevation and antibiotic protocols were instituted, the hurler was discharged after 24 hours and he returned to sports four weeks after the injury once his wounds had healed. The medics state that the introduction of mandatory helmet wearing across all age gradients by the GAA in 2010 has resulted in significantly less injuries attending emergency departments. The medics state that although the GAA forbids any tampering of helmets from factory specifications, modifications are known to be quite common, with a separate study showing that 31% of players admitting to modifying their faceguard in some way. That study completed last year found that the main reasons given for modification were: restricted vision, comfort and perceived poor quality of the helmet/faceguard, and anecdotally that players may modify one’s helmet to help improve peripheral vision and thus situational awareness. These modifications are responsible for some of the most serious injuries sustained in hurling ie penetrating wounds. Although it is likely unintentional that these modifications are intended to be dangerous they can result in sharp metal bars protruding from players helmets. They state: “Ultimately, the rules of helmet modification will need to be enforced by coaches and referees at a local level. Email “Warning over modified helmets after hurler sustains 'horrific' hand injury”. Feedback on “Warning over modified helmets after hurler sustains 'horrific' hand injury”.